There are very few areas where proponents of a policy, or those who are against it, seem so incapable of understanding what they are actually proposing than austerity. Austerity is defined as a state of reduced spending, and is normally done to reduce a budget deficit (when government spending is greater than tax revenue). This has effectively been Conservative government policy since 2010. Anti-austerity, then is when you disagree with austerity. Of course, ‘anti-austerity’ is popular. Why wouldn’t it be? You go out on the street and ask most peole if they would like money spent on them and they’ll probably say they will. This is especially true for the young, who after all are not the people funding public spending. If you want to get a cheap cheer on BBC Question Time you can demand that cuts are reversed and an end to austerity. But it isn’t a policy in itself. The argument for austerity is that ‘Britain needs to live within its means’. When the Conservatives entered Downing Street in 2010 the deficit was £168bn, on tax revenues of not much more than £600bn. That is a significant deficit, and was around 10% of the UK’s entire national output. They had campaigned on a pledge to reduce it, and at first promised to clear it by 2015. That we are now in the position where it might not be cleared until 2025 has many reasons. Labour have opposed every single cut to the deficit their Government left. The political impact of cuts anyway is difficult, because government spending is like eating, it expands a country’s stomach, meaning it gets used to being filled up, so any financial ‘diet’ is painful. Brexit has led to uncertainty, so taking more money out of the economy is not a good idea. This is the basis of the anti-austerity movement. Taking money out of the economy. Cuts can reduce the level of public services, or reduce public sector pay. Cuts to education and health spending can affect the productivity and health of our people and the economy well into the future. Cuts tend to affect the most vulnerable, simply because people on higher incomes are less likely to receive public spending and services. Take spending out of the economy and you take many peoples’ income down, which means they in turn cut spending, which again reduces incomes and thus tax receipts to help pay off the deficit – called the negative multiplier. So an anti-austerity policy is that all cuts should be reversed. But what about the deficit? We have a national debt of almost £2trn. That’s nearing our entire GDP. Doesn’t that have to be paid off. Are we just intent on swallowing money now that our children and grand-children will have to pay off. Don’t we care about that? The answer is partly that as long as the debt is payable (we pay more in debt interest every year than we spend on education) then we are fine. After all, look at the low rate the government is still able to borrow money at. The other answer that some of the anti-austerity movement have is to point to the analysis above, on the impact of cutting spending. They argue that taxes should be raised for those on higher incomes to help pay off the deficit and fund more spending. This is, of course popular…after all, you are effectively then able to bribe people with other people’ money. The problem is that you can control government spending, but not tax revenue. Government spending s literally something you can either do or not do. Tax revenue depends on peoples’ behaviour. If the tax rate rises, will they decide to not take the next promotion as the extra money they would get is reduced so much by tax? Will they leave the country? Will they seek to avoid the tax legally? If you charge higher corporation tax rates will they avoid that or reduce employment to pay it? Paying down the deficit by raising tax revenue is risky and makes many assumptions. My point is that there are no simple answers to governing. 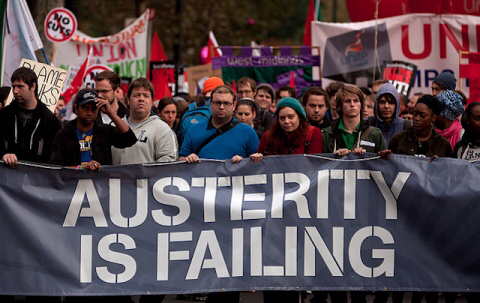 Austerity is controversial, but anti-austerity is not a policy unless you consider the impact behind it.